Voted one of the Coolest Towns in the Nation, Kennett Square is having one of its signature events on November 27, 2015, the Kennett Square Holiday Parade and Tree Lighting. The Kennett Square Holiday Parade starts at 6 p.m. and the best place to set up camp to watch is on State Street between Broad and Union Streets. 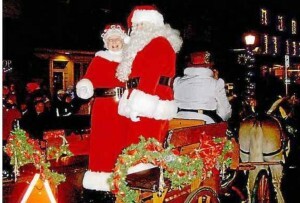 The Parade ends with the arrival of Santa Claus and Mrs. Claus on a horse drawn carriage and then the huge Kennett Square Christmas Tree is lit for the first time. This year, after the parade, children will be given gift bags to take to local merchants to receive free gifts. The good news on weather is that as of Sunday, the weather forecast for the start of the Kennett Square Christmas Parade and Tree Lighting is clear with temperatures in the 50’s. About the Author – Tim Rayne is a Personal Injury Attorney with the Chester County Law Firm MacElree Harvey with offices in Kennett Square and West Chester. Tim helps people who have been injured in accidents receive fair compensation from insurance companies. A lifelong resident of Kennett Square and graduate of Kennett High School, Tim is active in the local community and promotes Kennett Square Events and causes.